The formation of exciton-polaritons through strong light-matter coupling is a promising strategy for producing electrically pumped carbon-based lasers. 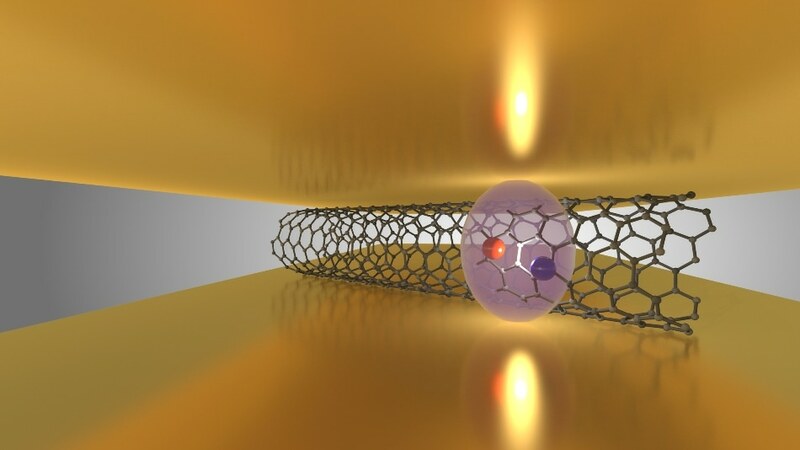 Scientists from Heidelberg University and the University of St Andrews (Scotland) have now, for the first time, demonstrated this strong light-matter coupling in semiconducting carbon nanotubes. Credit: Arko Graf (Heidelberg University). Researchers from the University of St Andrews (Scotland) and the Heidelberg University worked toward developing nanomaterials for optoelectronics, and have been successful in demonstrating, for the first time, a strong interaction exists between light and matter in semiconducting carbon nanotubes. Strong light-matter coupling of this type is critical in developing innovative light sources such as electrically pumped lasers that are based on organic semiconductors. In addition to other applications, they will be highly significant in the field of telecommunications. These findings are the result of collaboration between Prof. Dr Jana Zaumseil from the Heidelberg University, and Prof. Dr Malte Gather from the University of St Andrews. The results of the study have been reported in the journal, Nature Communications. When compared to traditional inorganic semiconductors such as silicon, organic semiconductors made of carbon are an energy-efficient and cost-effective substitute. Light-emitting diodes fabricated using carbon-based organic semiconductors have already found a wide usage in smartphone displays. Currently, research is ongoing to develop further components for application in data transmission, lighting technology, and photovoltaics. Yet, researchers have been unsuccessful so far in using organic materials to create one of the principal components of optoelectronics - the electrically pumped laser. This is due to the fact that organic semiconductors possess only limited charge transport potential. Prof. Zaumseil explains that in recent years, research has increasingly focused on laser-like light emission from organic semiconductors based on light-matter coupling. Sufficient interaction between excitons (matter) and photons (light) enables the particles to be coupled so strongly that they generate the so-called exciton-polaritons, which are quasi-particles that can emit light. Under certain conditions, such emissions possess the characteristics of laser light. As stated by Jana Zaumseil, head of the Nanomaterials for Optoelectronics research group at the Heidelberg University’s Institute for Physical Chemistry, integrating the exciton-polaritons with a sufficiently fast charge transport can bring us close to developing an electrically pumped carbon-based laser. For the first time, the collaboration between Prof. Zaumseil and Prof. Gather made the demonstration of the formation of exciton-polaritons in semiconducting carbon nanotubes highly feasible. In contrast to other organic semiconductors, the tube-shaped, microscopic-sized carbon structures transport negative as well as positive charges in an exceptional manner. Arko Graf, who is a PhD student and the first author of the study, explained that exciton-polaritons also exhibit exceptional optical properties. The researchers at the University of St Andrews and Heidelberg University perceive their research outcomes as a crucial initiative in developing electrically pumped lasers based on organic semiconductors. Besides the potential generation of laser light, exciton-polaritons already allow us to vary the wavelength of the light emitted by the carbon nanotubes over a wide range in the near-infrared.